Glass blocks make an ideal foundation for Christmas crafts that resemble decorated ice cubes -- only these cubes don't melt. Decorate the outside of the block, then illuminate the transparent glass by placing a clear or multicolored Christmas light strand inside of the block. Add warmth to cold winter days by positioning a lighted glass cube in a child’s bedroom as a night light, place one outside of the home and position yet another under the tree. Mix the diamond drill bit coolant according to the manufacturer’s instructions. Apply a thin layer of coolant to the end of a 1/2-inch diamond core bit. Put on safety glasses to protect your eyes. Drill a hole in the bottom of the glass block while maintaining a steady supply of coolant so that the glass does not crack. Maintain consistent pressure while drilling to avoid scratching the glass. Allow up to a full minute to drill the hole depending on the quality of your diamond core bit and the thickness of your glass block. Shake the glass dust out of the hole. Ensure the hole is large enough to fit the Christmas lights into the glass block. Print holiday-themed pictures on two pieces of adhesive label paper using a computer printer. Use the dimensions of the glass block to determine the size of the picture. Make the picture slightly smaller than the block so that the glass edges frame the picture and show off the glass. Use a computer image-editing program to crop the photo, create a border, enhance the picture’s colors and set the print area. Use two different pictures for each side of the block or use the same image. Cut out one of the pictures using scissors. Peel the back off the adhesive paper and lay it, sticky side up, on a flat surface. Position the block so that the hole will face down toward the bottom of the picture and will be the bottom of the finished ornament. Ensure that the picture faces the correct way. Align the bottom of the picture parallel with the edge that has the hole so the light cord will come out of the bottom of the block. Lay the smooth, square side of the glass block against the sticky side of the adhesive paper. Smooth out any air bubbles gently with your fingertips and flatten any creases. Cut out the other picture and repeat the aligned and affixing process on the opposite side of the block so that each square side of the block has a picture adhered to it. Spray the clear acrylic onto the picture paper to seal the first picture to the glass. Allow the picture to dry for 30 minutes. Spray the picture on the other side of the cube with clear acrylic and allow that side to dry for at least 30 minutes.The acrylic creates a glossy finish that allows light to illuminate the picture. Place the end of the Christmas light strand into the bottom of the glass block hole. Feed all 50 of the bulbs into the hole at the bottom of the block until only enough cord remains to plug it into the outlet. Cut a 42-inch length of wire ribbon or enough to completely surround the perimeter of the glass block. Allow at least 10 inches of extra ribbon. Fold the ribbon in half lengthwise to obtain the center point of the ribbon. Cut a lengthwise slit to allow the light cord to pass through the ribbon slit. Thread the light cord through the slit in the ribbon. Glue the ribbon to the glass block starting where the slit lines up with the glass block hole using the glue gun. Continue applying glue to secure the ribbon all the way around the perimeter using the glue gun. Make a bow at the top of the block using the excess ribbon and glue it in place. Plug the lights in and position the cord so that it is not visible. Use LED lights to reduce the amount of heat created inside the glass block. Glass blocks are available at many craft and home improvement stores, and range in size from about 4 to 12 inches. Some are cubical, and some have two square faces and four narrow sides. Glass blocks with predrilled holes are available at many craft and home improvement stores. 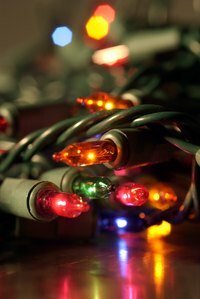 Use an outdoor-rated light strand and place the decorated block outside. Try using Christmas themed cling-on decals, stamps, glass paint or stencils to decorate the cube. Wear safety glasses when drilling glass. Use enough coolant to keep the glass wet while drilling the hole, or else the glass will shatter. It's clear that sturdy glass block has a lot to offer for the inspired and imaginative home decor expert.